Sort out all your hunger pangs at Indiranagar’s newest joint Fullyfilled. They do amazing shawarmas, sandwiches, and momos under the INR 100 mark. One thing that LBB knows well is that in Indiranagar finding a quick meal under the INR 100 mark is hard. But that was until we took a different route back to our office and ended up right in front of Fullyfilled. Non-descript if not for the bright yellow board screaming the name, the joint is like a takeaway counter with a few seating options down below in the basement where it shares space with The Donut Bakers. A no-fuss menu of shawarmas, sandwiches, and momos are what’s on offer. Our favourite was the shawarma. 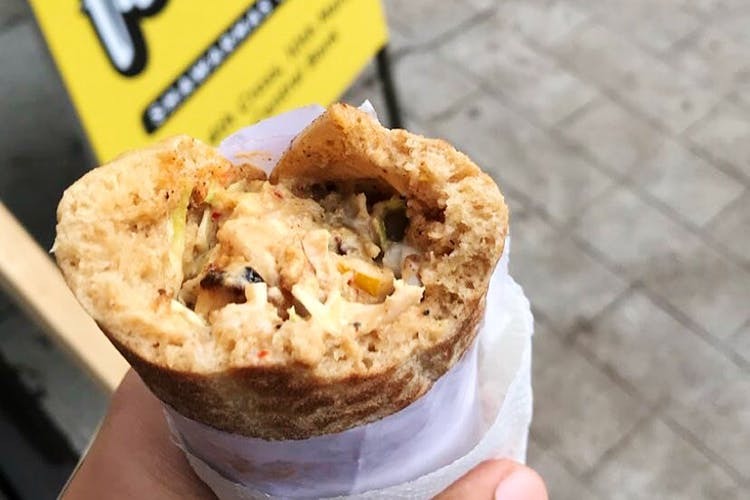 It’s one of the better shawarmas we’ve had (though it was more of a wrap) thanks to the juicy, grilled chicken, the Harissa mayo (they have a regular one too), and the whole wheat pita bread. Pick from the Classic, Pure Chicken or Shawarma On Plate (this one is to be shared as it’s too much chicken for one, unless you are really hungry). The Plate is also one of the three things on the menu that will set you back by INR 120. Rest everything is either INR 100 or below. Oh, and you can add cheese to your shawarma too for INR 15. Not a fan of shawarma? Go for the sandwiches then. Instead of white bread, they favour whole wheat brown bread. Stuffings include mushroom & cheese, herbed chicken, chicken tikka, and the classic Bombay Masala. Guys, they also do dessert sandwiches and from what we hear Nutty Triple Decker and Nutella Grill are top sellers. We now know where we can get our sandwich cravings now. We are going back for the momos that come in bhel-style which is essentially fried momos tossed in onions and served saucy and hot. To help you wash down all that, there’s cold coffee or iced tea.